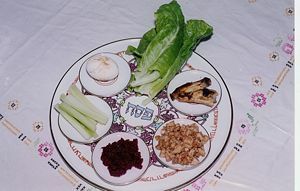 Traditional arrangement of symbolic foods on a Passover Seder Plate. Kashrut (from Hebrew כַּשְרוּת meaning "fit" or "proper") refers to Jewish dietary laws that are in accord with halakha (Jewish law). Popularly known as kosher (meaning "fit" for consumption), Jewish dietary laws derive from the Torah's Books of Leviticus and Deuteronomy, and are further elucidated in the oral law (the Mishnah and the Talmud), and codified by later rabbinical authorities. The Torah does not explicitly state the reason for most kashrut laws but many justifications have been offered in subsequent reflection including philosophical, ritualistic, practical and hygienic reasons. For example, it has been said that Kashrut serves as a daily exercise in self-discipline and self-control, strengthening the practitioner's ability to cultivate ritual purity and holiness. Additionally, Jews consider the need to avoid unnecessary suffering of the animal a reminder to the believer that having the power of life and death is a serious responsibility. In addition to Judaism, many other religions contain specific dietary regulations to encourage their followers to purify themselves, to avoid "unclean" foods, and to foster a distinct identity. Some have also suggested that science supports many of the intuitions found in Kashrut, albeit not in all specific kosher laws. The religion of Islam has a related but different system of dietary laws, named halal, and both systems have a comparable form of ritual slaughter (shechita in Judaism and Ḏabīḥah in Islam). Many religions follow dietary guidelines to encourage purity, discipline and symbolic remembrance in the practice of their community. There continues to be a debate among various theories about the purposes and meaning of the laws regarding kashrut. Historically, the Jewish kashrut laws are counter some of the rituals of ancient times, such as eating only one leg of a live animal so that people would not have to deal with eating the entire animal at one time (Babylonian Talmud Sanhedrin 56b); this law applies even to non-Jews and is part of the Noahide Laws. Some authorities have ruled that any unnecessary suffering by the animal can render otherwise kosher meat treife. Food that is not in accord with Jewish law is called treif (Yiddish: טרייף or //treyf,// derived from Hebrew: טְרֵפָה trēfáh). In the technical sense, treif means "torn" and refers to meat which comes from an animal containing a defect that renders it unfit for slaughter. An animal that died through means other than ritual slaughter (or by a botched slaughter) is called a neveila which literally means "an unclean thing." These laws were ordained for the protection and health of God's people in a time where basic hygiene was not yet understood. For example, carrion was against Jewish law; modern sanitary rules also exclude carrion, which may be from diseased animals or contain toxins of decomposition. Shellfish, also forbidden by Jewish law, can be toxic unless harvested and stored in known conditions. Hygiene-based explanations cannot be found to support every law. These laws have no meaning other than to instill obedience. Related to this is the idea that the dietary laws were given as a demonstration of God's authority and that man should obey without asking for a reason. However, this last view has been rejected by most classical and modern Jewish authorities, including Maimonides who holds that a Jew is permitted to seek out reasons for the laws of the Torah. Classifying various chemical additives derived from non-kosher meat products as nonfood and permissible (for example, permitting rennet from cow's stomachs to be used in cheese and horse-hoof gelatin in foods). Although Reconstructionist Judaism and some perspectives within Reform Judaism encourage individuals to follow some or all aspects of the kashrut rules required by the more traditional branches, these branches do not require their observance and do not maintain their own sets of required rules. One of the Kosher requirements is having cloven hooves such as goats (upper left), pigs (lower left) and cows (lower right). Pigs, in spite of their cloven hooves, remain non-kosher because they lack the other kosher sign, cud-chewing. Horses (upper right) are entirely uncloven. Meat and milk (or derivatives) cannot be mixed in the sense that meat and dairy products are not served at the same meal, served or cooked in the same utensils, or stored together. Observant Jews have separate sets of dishes, and sometimes different kitchens, for meat and milk, and wait anywhere between one and six hours after eating meat before consuming milk products. Only meat from mammals that both chew their cud and have cloven hooves are kosher (permissible to eat). 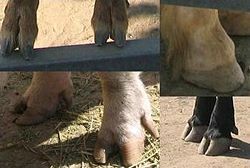 Animals with one characteristic but not the other (the camel, the hyrax and the hare because they have no cloven hooves, and the pig because it does not ruminate) are specifically excluded (Leviticus 11:3-8). Birds must fit certain criteria; birds of prey are not kosher. There must be an established tradition that a bird is kosher or similar to one that is before it can be consumed. The turkey, for example is native to the New World and would therefore not be found under tradition. However, it is similar to a known bird, the "fowl of India" and is therefore acceptable. Fish must have fins and scales to be kosher (Leviticus 11:9-12). Shellfish and non-fish water fauna are not kosher. Biblical rules control the use of agriculture produce: for produce grown in the Land of Israel a modified version of the Biblical tithes must be applied, including Terumat HaMaaser, Maaser Rishon, Maaser Sheni, and Maaser Ani (untithed produce is called tevel); the fruit of the first three years of a tree’s growth or replanting are forbidden for eating or any other use as orlah ; produce grown in the Land of Israel on the seventh year is Shviis, and unless managed carefully is forbidden as a violation of the Shmita] (Sabbatical Year). The circled U indicates that this product is certified as kosher. Store-bought foods can be identified as kosher by the presence of a hechsher (plural hechsherim), a graphical symbol that indicates that the food has been certified as kosher by a rabbinical authority. (This might be an individual rabbi, but is more often a rabbinic organization.) One of the most common symbols in the United States is the "OU," a U inside a circle, standing for the Union of Orthodox Congregations (or "Orthodox Union"). Many rabbis and organizations, however, have their own certification mark, and the other symbols are too numerous to list. Many kashrut certification symbols are accompanied by additional letters or words to indicate the category of the food. In common usage is "D" for Dairy, "M" for Meat or poultry, "Pareve" for food that is neither meat nor dairy, "Fish" for foods containing such, and "P" for Passover (not to be confused with Pareve). Note that many foods meet the U.S. FDA standard for "Non-Dairy" while they do not meet the Jewish standard for "Pareve" and are labeled with the "D" next to the kosher symbol. A single K is sometimes used as a symbol for kosher, but as a letter cannot be trademarked (the method by which other symbols are protected from misuse) in many countries, it only indicates that the company producing the food claims it is kosher. The hechsheirim of certain authorities are sometimes considered invalid by certain other authorities. Before there were certification agencies, kosher consumers would read the list of ingredients to determine if a product was acceptable to eat. Today, however, this is considered insufficient as many things are not included in this list, such as pan lubricants and release agents (which may be derived from lard), flavorings ("natural flavorings" which are more likely to be derived from non-kosher substances than others), etc. Reading the label can, however, identify obviously unkosher ingredients. Producers of foods and food additives can contact Jewish authorities to have their products certified as kosher: a committee will visit their facilities to inspect production methods and contents, and issue a certificate if everything is in order. In many cases constant supervision is required. For various reasons, such as changes in manufacturing processes, products which were kosher may cease to be so; for example, a kosher lubricating oil may be replaced by one containing tallow. Such changes are often coordinated with the supervising rabbi or organization to ensure that new packaging, which will not suggest any hechsher or kashrut, is used for the new formulation. But in some cases existing stocks of preprinted labels with the hechsher may continue to be used on the now non-kosher product; for such reasons, there is an active "grapevine," among the Jewish community, as well as newspapers and periodicals, identifying which products are now questionable, as well as products which have become kosher but whose labels have yet to carry the hechsher. Orthodox Judaism and Conservative Judaism hold that Jews should follow the laws of kashrut as a matter of religious obligation. Reform Judaism and Reconstructionist Judaism hold that these laws are no longer binding. Historically, Reform Judaism actively opposed kashrut as an archaism inhibiting the integration of Jews in the general society. More recently, some parts of the Reform community have begun to explore the option of a more traditional approach. This tradition-leaning faction agrees with mainstream Reform that the rules concerning kashrut are not obligatory, but believe that Jews should consider keeping kosher because it is a valuable way for people to bring holiness into their lives. Thus Jews are encouraged to consider adopting some or all of the rules of kashrut on a voluntary basis. The Reconstructionist movement advocates that its members accept some of the rules of kashrut, but does so in a non-binding fashion; their stance on kashrut is the same as the tradition-leaning wing of Reform. Many Jews who do not meet the complete requirements of kashrut nevertheless maintain some subset of the laws; for instance, abstaining from pork or shellfish. Many Jews will likewise avoid drinking milk with a meat dish. Similarly, many keep a degree of kashrut at home while having no problems eating in a non-kosher restaurant, or will follow leniencies when eating out that they would not follow at home. According to Gordon J. Wenham, the purpose of kashrut is to help maintain Jews as a separate people. The laws of kashrut had the effect of preventing socialization and intermarriage with non-Jews, helping the Jewish community maintain its identity. Wenham writes that "circumcision was a private matter, but the food laws made one's Jewish faith a public affair. Observance of the food laws was one of the outward marks of a practicing Jew, and this in turn enhanced Jewish attachment to them as a reminder of their special status." There have been attempts to provide empirical support for the view that kashrut laws have hygienic benefits. Another theory is that kosher animals were healthier to eat than non-kosher animals. It was also noted that the laws of purity (Leviticus 11–15) not only describe the difference between clean and unclean animals, but also describe other phenomena that appear to be related to health. Such a rationale seems reasonable when considering the laws prohibiting the consumption of carrion birds or birds of prey (which are advantageous scavengers), as they may carry disease from the carrion they consume; shellfish, which as filter feeders can accumulate harmful parasites or toxins; or pork, which can harbor trichinosis if not properly cooked. Thus, it was natural for many to assume that all the laws of kashrut were merely hygienic in intent and origin. One of the rabbinical authorities that mention the hygiene hypothesis is Maimonides in his Guide for the Perplexed. In 1953, Dr. David I. Macht, a Johns Hopkins University researcher, performed experiments on many different kinds of animals and fish, and concluded that the concentration of zoological toxins of the "unclean" animals was higher than that of the "clean" animals, and that the correlation with the description in Leviticus was 100%. His criterion for toxicity was the effect on germination of lupin seedlings. In addition, Dr. Macht's research indicated harmful physiological effects of mixtures of meat and milk, and ritually slaughtered meat appeared to be lower in toxins than meat from other sources The conclusions of the paper published in Johns Hopkins Bulletin of the History of Medicine were challenged in a paper by biologists written at the request of a Seventh-day Adventist Church publication. For a number of reasons, however, this idea has fallen out of favor among Biblical scholars. Fruits and vegetables may be eaten without prohibition even though there are many poisonous herbs, seeds, berries, and fruits. Additionally, this hypothesis does not explain other parts of the Jewish dietary laws; for instance forbidding the consumption of fish without true scales, such as sharks and swordfish, or fruit from trees which are less than four years old, or residual blood in meat. Anthropologist Marvin Harris has proposed that the Jewish prohibition of pork results from the fact that in arid countries such as Israel it is possible to raise pork only by feeding it grains that are also eaten by people, since the pigs cannot forage in nonexistent forests. In bad harvest years there would be a social conflict between those who could afford to raise and eat pork and those who would be at risk of starvation due to the scarcity of edible grains. Thus, in the interest of social survival, the prohibition entered the Jewish religion. Harris in Cows, Pigs, Wars and Witches cites worldwide examples of similar ecologically determined religious practices, including other prohibitions of pork for similar reasons. According to Harris preserving pork requires too much salt to guarantee the elimination of the carcass liquids, due to high fat content. The reverse process of washing out the preserving salt when it came to eating the meat also made it difficult to justify. This same reason would apply to many other forbidden foods, either because preservation by salting was impossible or because the salting process was not reversible. During the first few centuries of the Common Era, some philosophers held that the laws of kashrut were symbolic in character. In this view, kosher animals represent virtues, while non-kosher animals represent vices. The first indication of this view can be found in the second century B.C.E. Letter of Aristeas (par. 145-148, 153). It later reappears in the writings of Philo of Alexandria, and in the writings of some of the early Church Fathers. This hypothesis has long since been rejected by most Jewish and Christian scholars. Modern Biblical criticism also has found nothing to support this hypothesis, although the concept of the pig as a particularly 'unclean' animal persists among Jews. Although the symbolic explanation for kashrut has been largely rejected, a number of authorities maintain that the laws are intended to promote ethical and moral behavior. A recent authority who has reexamined the symbolic/ethical meaning of kashrut is Rabbi Samson Raphael Hirsch (Germany, nineteenth century). To some degree, the prohibition on combining milk with meat represents a symbolic separation between death, represented by the flesh of a dead animal, and life, represented by the milk required to sustain a newborn creature. The often-quoted humane component to this law is also of symbolic value; the Torah prohibits 'seething the kid (goat, sheep, calf) in its mother's milk', a practice cruel only in concept, which would not be understood as cruelty by either the kid or its mother and would not cause them additional suffering; but which could still potentially inflame a human's taste for ultimate power over those creatures who are weaker. Thus, kashrut prohibits the practice itself, even if the resulting mixture is to be discarded. Since there are few laws of kashrut restricting the consumption of plant products, many people assume that a strictly vegetarian meal would usually be inherently kosher. In practice, however, those who follow the laws of kashrut do not automatically regard all restaurants or prepared or canned food which claim to be vegetarian as kosher, due to the likelihood that the utensils were used previously with non-kosher products, as well as the concern that there may be non-kosher ingredients mixed in, which, although they may still be considered vegetarian, would make the food not kosher. Additionally, kashrut does provide special requirements for some vegetarian products, such as wine and bread. Most vegetables, particularly leafy vegetables (lettuce, cabbage, parsley, dill, etc. ), must be thoroughly checked for insect infestation. The consumption of insects involves between three and six violations of Torah law; so, according to Jewish Law, it is a greater sin than the consumption of pork. The proper procedure for inspecting and cleaning will vary by species, growing conditions, and the views of any particular rabbi. Kashrut prohibits slaughter of an unconscious animal, and the slaughtering is done by cutting the front of the throat first. Some animal rights groups object to kosher slaughter, claiming that it can take several minutes for the animal to die and can often cause suffering. Since the spinal cord is not severed completely at the first cut, it is thought that the slaughtered animal's nervous system continues to function during the initial moments of the slaughter, causing the animal to undergo an agonisingly slow and painful death. In 2003 in the UK, an independent advisory group - the Farm Animal Welfare Council (FAWC) - concluded that the way Kosher (and Halal) meat is produced causes severe suffering to animals and should be banned immediately. Kosher and halal butchers deny their method of killing animals is cruel and expressed anger over the recommendation..
↑ e.g. Exodus 23:19 among other places, a "kid may not be boiled in its mother's milk." ↑ Rabbi Zalman Posner, Think Jewish, Why Do Mitzvot? (1978) . chabad.org. Retrieved November 11, 2008. ↑ William H. Shea, Clean and Unclean Meats, Biblical Research Institute, December 1998. Biblical Research Institute. Retrieved September 18, 2008. ↑ Dr. David I. Macht, "An Experimental Pharmalogical Appreciation of Leviticus XI and Deuteronomy XIV." . Bulletin of the History of Medicine 27:444-450. Retrieved September 18, 2008. ↑ Ministry Magazine, March 1953, p37-38 "This Question of Unclean Meats" Responses to Macht's study from heads of biology depts. Retrieved September 18, 2008. ↑ Halal and Kosher slaughter 'must end' BBC News, June 10, 2003, Retrieved September 17, 2008. Bailey, Stephen.Kashrut Tefillin Tzitzit: Studies in the Purpose and Meaning of Symbolic Mitzvot Inspired by the Commentaries of Rabbi Samson Raphael Hirsch, Jason Aronson, 2000. ISBN 978-0765761064. Harris, Marvin. Cows, Pigs, Wars, and Witches: The Riddles of Culture. New York: Vintage Press, 1989. ISBN 0679724680. Posner, Rabbi Zalman. Think Jewish, Why Do Mitzvot? 1978. .chabad.org. Retrieved November 11, 2008. Wenham, Gordon J. "The Theology of Unclean Food," The Evangelical Quarterly 53, (January March 1981): 6-15. This page was last modified on 12 November 2008, at 17:36.